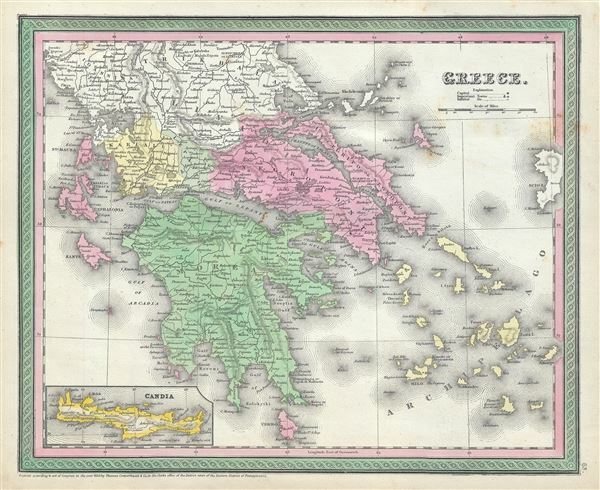 This is a fine example of Thomas Cowperthwait and S. A. Mitchell's 1854 map of Greece. It covers the southern part of modern Greece including the Peloponnese (Morea), the Negroponte, and Karalla, as well as the Ionian Republic and the Greek Isles inclusive of Crete (Candia) via an inset in the lower left. The whole is engraved in Mitchell's distinctive style with green border work and vivid pastels. Political and topographical features are noted and color coded with elevation rendered by hachure. At the time, this part of Greece was the center of the Greek Independence movement having attained independence from the Ottoman Empire in 1821. Rumsey 3803.067. Phillips (Atlases) 809.